While this was boiling, I started working on the beets. I had accumulated enough from the farm share to make 2 quarts of pickled beets - 1 jar for me and 1 for my mother-in-law who will be taking it home with her. By the time I got the beets in the jars, the soup was ready. This went into 2 quart jars and 1 pint jar and into the pressure canner. This is the first time I've had both canners going simultaneously. 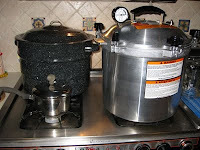 I am surprised I have enough room on my stove - these are both pretty big pots. The little pot is the rest of the chicken soup, waiting for lunchtime. There are a lot of thunderstorms passing through; it seems like a good soup day even though it's humid and hot out there. The beets are now done but the soup is still processing - 45 minutes to go.